Belgian bistro B TOO has opened at last, bringing a touch of famous to 14th Street in the form of Top Chef Star Bart Vandaele. We’re serious when we say that this brain child of Belgian cuisine starting culinary school at age 12. Chef Vandaele was in plain sight working away in the kitchen admiring his bright, shiny and new Logan Circle locale. It’s so new, that the downstairs dining den still smells of fresh paint. After meal one, we discerned there is no doubt B TOO will play a major role in raising the bar for neighborhood fare. The Best Thing on the Menu: Bloedworst Wafel Met Appeltjes is just one example of creativity, color and flavor. 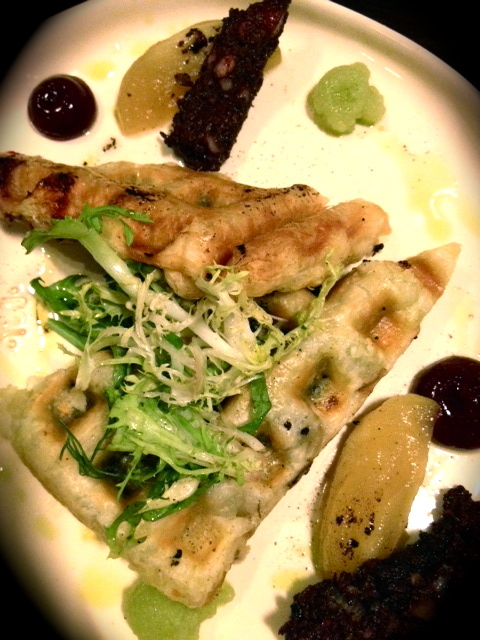 The appetizer is essentially a fried waffle stuffed with blood sausage and served with caramelized apple, green apple sauce and vincotto cream. We also sampled the foie gras lollypop, steak tartare, venison filet and fried orange sorbet. All winners. There is one thing all of these disparate dishes had in common: dollops. B TOO appears to have an unbreakable obsession with dotting each plate with vibrant blobs of colorful sauces. If the food isn’t reason enough to make a reservation right away, the beer menu is nothing short of a bible. Even non-beer lovers will find a good match, which we recommend since wines by the glass are steep. Can’t get enough of Chef Vandaele? Visit his other restaurant, Belga Café. Bloedworst Wafel Met Appeltjes not your BTM? Post your favorites in the comments section. This entry was posted in Restaurants and tagged B TOO, Bart Vandaele, Belga Cafe, Best Thing on the Menu, Blood Sausage, BTM, Waffle. Bookmark the permalink. I had the Brussels Mussels last night and they were delicious. In addition to the mussels and the half-lobster, the broth was perfect for dunking the freshly warmed bread they serve with it.